This page is based on a letter sent to all clubs by the British Caving Association (BCA). The BCA has been asked by Government (DCMS: the Department for Culture, Media and Sport and NSPCC: the National Society for Prevention of Cruelty to Children) to support them in their Child Protection drive. 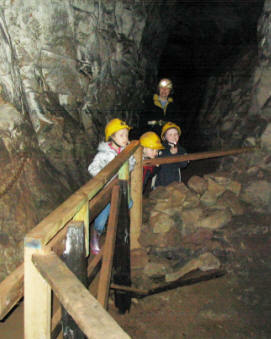 The BCA has made various policy matters clear to DCMS and NSPCC, and again to caving and mining clubs, that whilst it fully supports child protection legislation and also feels that the DCMS and NSPCC approach is excellent when applied to popular competitive sports, it has little or no relevance to caving where 'recruitment' is very different. The caving policy matters made clear to them are:- 1. the BCA does not regard caving as a suitable activity for "children"; 2. however, it feels that "children" quite often (but by no means always), develop into "young persons" at around the age of 14 years; 3. it also believes that it is in the 14-20 age range that "young persons" are most likely to develop an interest in caving, and that we ignore this at our peril! Bearing the above in mind the BCA has suggested that the great majority of caving clubs, with membership of 50-80 or less need do little more than endeavour to ensure that all of their officers and committee members read the NSPCC brochure, as well as the BCA Child Protection Policy (and its accompanying Guidance Notes), and then formally agree to adopt the latter. The BCA also suggests that there is another category of caving club, more differentiated by its activities than by its membership size, that does need to go a little further. These are referred to as "larger caving/outdoor clubs with property" and the DCC would fall into this category. BCA advice to these larger clubs is that they definitely need to either adopt the BCA Policy and Guidance Notes, or develop their own parallel documents. The DCC has taken this approach and has its own child protection policy based on the BCA draft. The BCA is strongly against the approach whereby caving clubs feel that they should have nothing to do with this legislation and simply say that henceforth under 18s will not be allowed to take any part in their activities. It has two reasons for saying this:- 1. by doing this such clubs will be isolating themselves from new younger persons entering their club, and long-term they will be heading for the demise of their club; and 2. they will not 'escape' this legislation because it also applies to all adult - child relationships, as well as to relationships with "vulnerable adults". The DCC endorses this view. We will try to keep references to these documents up to date but for the definitive versions, you should refer to the BCA website and the DCMS website.